In this part of the world, we’re right smack-dab in the middle of winter and oh my is it cold. Chilly temps leave me wanting nothing but hot drinks, long baths, fireside chats (yes, that’s a thing), and hearty comfort food. Enter this rich red curry. 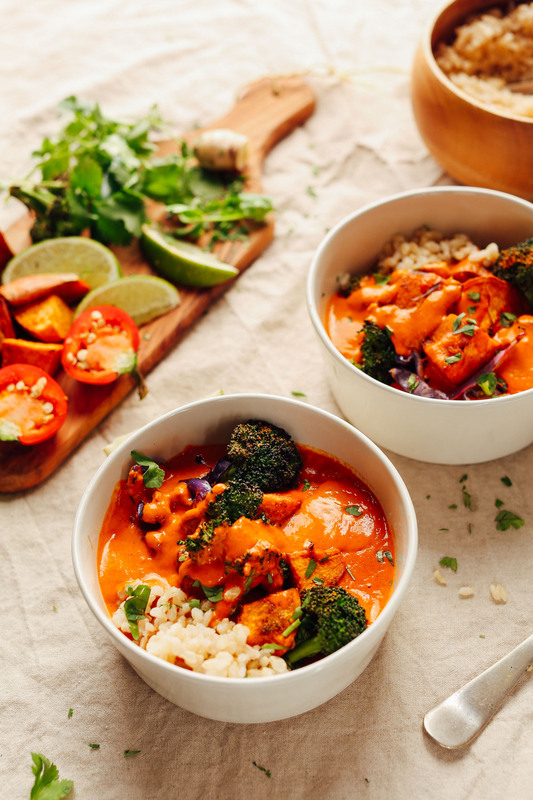 If you’re looking to spice things up in the kitchen but still get in a ton of good-for-you vegetables and anti-inflammatory spices, this is the recipe for you. Let’s do this! This curry requires just 30 minutes to prepare and ingredients you likely have on hand right now! For vegetables, I went with sweet potatoes, cabbage, and broccoli because: favorites. But you could sub whatever seasonal vegetable is lingering around your kitchen at the moment. Otherwise, it’s basics like shallot, ginger (hello digestive and anti-inflammatory best friend), curry paste, and coconut milk. While the vegetables roast away, simply sauté the garlic and shallot (add a pepper for extra heat!) and add in the curry paste and coconut milk plus a little turmeric (nature’s gold dust) and coconut aminos. Then you’re in curry heaven. Serve with cauliflower rice, brown rice, or quinoa for even more deliciousness and comfort factor. This would make the perfect quick meal to put on the table during the week or when you’re hosting guests, as it’s a crowd pleaser. It’s perfect the day of and even better as leftovers, in my opinion, which makes it ideal for batch cooking and reheating throughout the week for easy lunches and dinners. 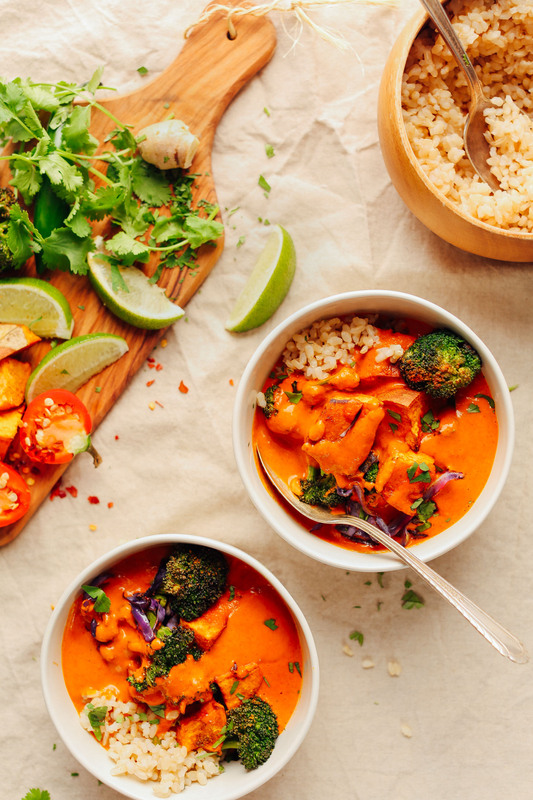 If you’re into curries, also be sure to check out our Thai Yellow Curry with Mango, Spicy Red Lentil Curry, Sweet Potato and Cauliflower Curry, 1-Pot Pumpkin Yellow Curry, Coconut Red Curry with Chickpeas and Eggplant, Curry-Spiced Cashews, or Curried Lentil and Roasted Vegetable Salad! *Note: 10/9/18 – Recipe updated to double sauce for greater servings. 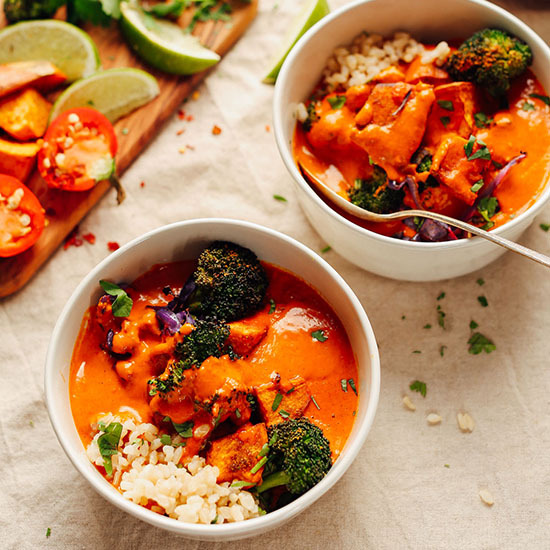 Rich coconut milk and red pepper-based curry with roasted vegetables and cauliflower or brown rice! A hearty, flavorful, 30-minute plant-based meal. Preheat oven to 375 degrees F (190 C) and line a baking sheet (or more, as needed) with parchment paper. Add vegetables to a mixing bowl and toss with with oil (or water), maple syrup, curry powder, and sea salt. 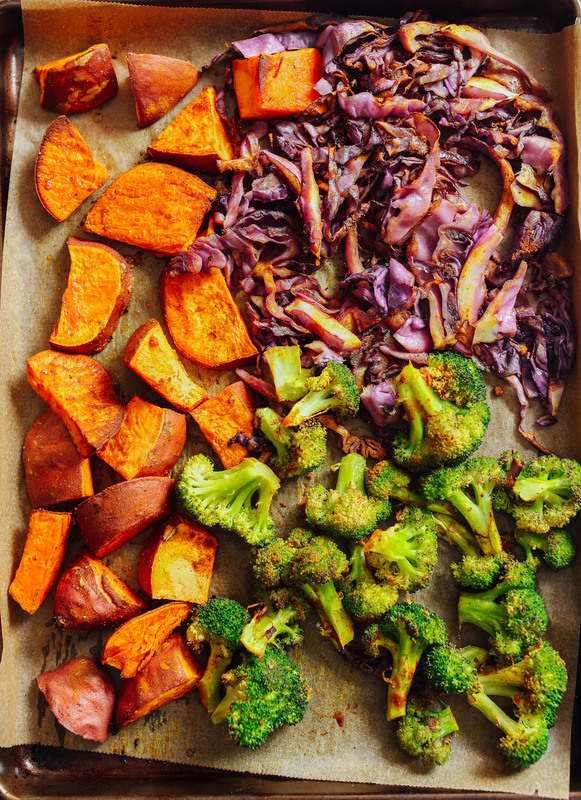 Add the sweet potatoes to a baking sheet (leaving broccoli and cabbage behind) and roast for 10 minutes. At the 10-minute mark, remove pan from oven and add broccoli and cabbage (this way, the cabbage and broccoli won't burn). Return to oven and roast for 12-15 minutes more. 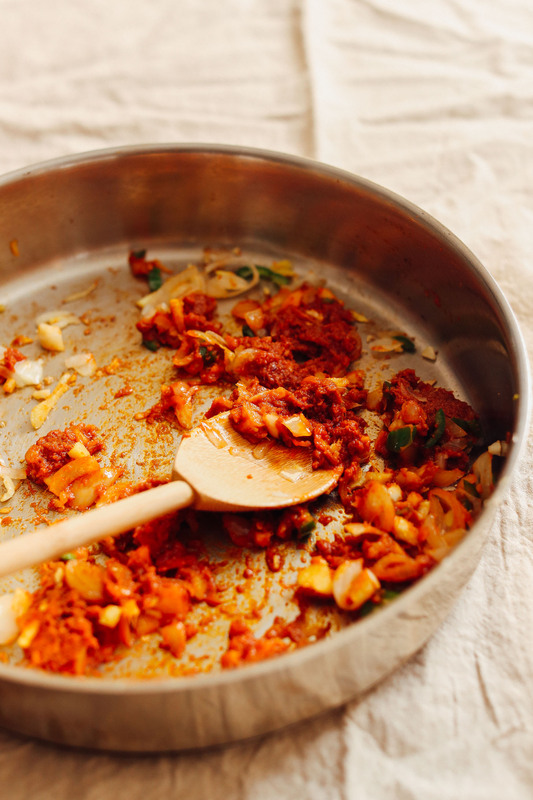 In the meantime, prepare curry by heating a large rimmed skillet or pot over medium heat. Once hot, add coconut oil (or water), shallot, garlic, and ginger. Sauté for 3 minutes, stirring frequently. Add curry paste and cook for 2 minutes, stirring occasionally. Then add coconut milk, sea salt, turmeric, maple syrup, and coconut aminos. Whisk to combine, and once bubbling, reduce heat to low. Simmer for 10 minutes. Then add lime juice. Taste and adjust flavor as needed, adding more turmeric for earthy flavor, curry paste for spice or curry flavor, coconut aminos or salt for saltiness, maple syrup for sweetness, or lime juice for acidity. I added more lime juice, coconut aminos, and a bit more turmeric. Optional: Transfer sauce to a blender (or use an immersion blender) and blend on high until puréed. This makes the sauce creamier, but it isn’t necessary. To serve, divide the sauce between serving bowls and rest some veggies in the center along with a spoonful of (optional) rice or grain of choice. Garnish with cilantro or lime wedges (optional). This dish is delicious fresh and as leftovers. Store leftovers (separately) in the refrigerator up to 4 days. Reheat on the stovetop or microwave until hot. *My favorite vegan curry brands are Thai True and Thai Kitchen. *If using our DIY Red Curry Paste in this recipe, we recommend adding more of it as it is less concentrated than store-bought brands. *4 cloves garlic is equal to approximately 2 Tbsp minced garlic. *1 Tbsp (12 g) coconut sugar can be used in place of 1 Tbsp maple syrup in curry. *Nutrition information is a rough estimate calculated with oil and without sides/garnishes. Serves 2 as an entrée, 4 as a side. For more protein, top with roasted cashews or serve with quinoa. Hey you guys I’m a big fan of your recipes. This one was excellent, I did vary it slightly I substituted broccoli rabe for the broccoli. It really worked well, the bitterness of the rabe was complimented by the sweetness of the dish not to mention the texture of the cabbage and rabe are great together as too. Thanks so much for sharing, Pete! Can the sauce leftovers be frozen? Yes. Up to 1 month. Hope that helps! Delicious!!! Love the roast veggies and the combo of sweet and citrus with a little heat. Perfect! I’ve made this recipe 5+ times, it’s one of my favorites! My brother made it for me when I was visiting him. Each time it was great. I love the combination of roasted vegetables. The red curry sauce is excellent! Really yummy! I roasted the veggies ahead of time – ended up having them in the oven for about 40 mins and just added them 5 or so mins before the end to heat through. Will definitely make again. I haven’t made a curry in a while but looked this up in the supermarket carpark today before my food shop and I’m so glad I did! Wow, the flavour tastes so yummy! I can’t wait to eat this for my work lunches over the next few days. The only thing I did different was use a tin of coconut milk and a carton of coconut cream as I only noticed after chopping the veg I only had 1 can of coconut milk. But it turned out so good, so next time I’ll use the coconut cream with the milk again. Hi! I followed this recipe to a T (apart from subbing the sweet potato for regular potatoes because I don’t like the taste of the former in curries) but the sauce turned out watery and yellow, rather than the glossy red sauce in your pics (I used your DIY curry paste too ;)) and was wondering why that would be? That being said, it tasted great but was a little sad the sauce was not as thick and red as expected – I blended it and simmered it for ages too. Hi Nayomi, sorry for the confusion! We used store-bought curry paste when we made this recipe. Our DIY blend is less concentrated and therefore requires using more of it in order to achieve the same results as store-bought. We have added a note to clarify this for the future. Thanks for letting us know! This was so good!! I told my husband that if he did the parent teacher conferences, I would have something delicious on the table when he got home. Wow! This blew it out of the park! We were both so happy with this recipe. I couldn’t find sweet potatoes so I used 2 yams. Chopped them up along with 2 carrots and boiled them for a few minutes before tossing with the broccoli and cabbage and spices. I ended up roasted them all together. Except for that , I followed the recipe to a T. Highly recommend!! He promises to go to the other kids’ parent teacher conferences too if I make this! ha. So worth it. So so so good. Best and easiest curry recipe I’ve ever found. I sautéed the veggies on high heat instead of roasting because my oven is tiny, still came out great. I can’t wait to eat this all week. I have tried to make curry MANY times and my family, nor myself have ever liked them…. until NOW! I LOVE this! And it is so versatile- can easily pick and choose other veggies to roast. This is DELICIOUS! Thank you for the recipe! I always feel some raw taste from the curry when I cook this (I use thai kitchen brand like you and I follow the exact same time mentioned in your recipe; Only difference that I see is that I use soy sauce instead of aminos and my coconut milk is from O2 vons. I also add different set of unroasted veggies). The raw taste comes from the curry paste as though it is not cooked enough. Any tips for me? I made this tonight. I am not a cook. My husband has always done the lion’s share of the cooking. So I am a novice cook learning to cook so I can transition to a plant-based diet. There are a lot of ingredients and a lot of moving parts in this recipe. I wasn’t able to carry on a conversation while I cooked this recipe!! Everyone loved the dish so I will make it again! However, in future, I will measure out all the many ingredients and combine them where indicated well before I start cooking. Having to measure on the fly as I am needing to add them to the sauted ingredients, for example, caused this novice cook more than a little stress. I did opt to blend the curry as a final step to make it creamier and I’m glad I did. I used quinoa. In future, I think I’d prefer rice which will do a better job of soaking up the delicious curry. In making the first sauce to douse the roasted vegetables, I realized I needed twice the amount to cover the vegetables. I used broccoli, sweet potato and red cabbage as I love those veggies too. In making the curry, I adjusted the flavor to make it sweeter by adding two additional tablespoons of maple syrup and that made it just right. I neglected to buy coconut aminos, so I don’t know how the addition of that might have altered the taste. We will be enjoying our leftovers for several days! One of my very favorite recipes. Just used red peppers in place of cabbage and a few carrots. Yum! Would work with any vegetable. So easy too. Thanks for your fantastic recipes. I love that they are SO healthy. Love the recipes and photos, but aren’t you folks going pretty heavy on the advertising these days?! It’s one thing to make some money with the occasional, intrusive ad, it’s a whole other level to blanket your site and pages with horrible advertising. Nobody likes advertising except the corporations and the people making money from “selling their souls”. I’m going to rethink my desire to use this site. I used to love it. Now, it feels toxic and insulting. Do other readers agree? This world is full of foulness. I can accept that because I don’t expect this fallen “world” to offer anything truly worthwhile anyway. But when you find something nice and it feels genuine, it’s startling and objectionable when the creators of that thing show you their nasty side and throw you under the bus of commercialism. I guess my faith needs to be redirected where it’s best suited, above. Humanity is weak and shows it’s love of this world every day, regardless of my hope in humanity. It’s the same, sad story of mankind re-enacted time and time again: to sin is human. Thank Gog, literally, we can be saved from all this nonsense. I’ve made this several times with different vegetables and it’s my favorite curry recipe! The sauce can be stretched easily with a little extra broth or water if you like it a little thinner (my kids prefer it that way). Otherwise, I make it as written and it pleases every time! Thank you!! Yay! Thanks for sharing, Sandy! Wonderful flavor- thank you Dana! This is the best authentic-tasting curry! I have made the recipe as written but I’ve also subbed the vegetables I have on hand and added chickpeas or lentils. It comes out so freaking creamy and delicious (use the regular full fat–not lite, guys!). I think it has a perfect amount of heat without the maple syrup so it can easily be made without that. Thanks for making such a solid curry recipe, Dana! We’ve made this several times with great results! My omnivore partner loves it as much as I do. We subbed kale for the red cabbage this time, but simmered the kale in the curry sauce rather than roasting. Thank you so much for sharing this awesome recipe! Obsessed. Have made this on multiple occasions without red curry paste and it is delicious even without it! I have made many homemade Red Curry recipes and I have to say this is the best one. The flavor tastes just like red curry from the restaurant. I will definitely be adding this to my dinner rotation. Minimalist Baker has the best recipes! We love this recipe. I usually double it when I make it!! Did we recipe recently change? For example: It used to say 4Tbsp for curry paste and now it’s 6. Why the change? Hi Jenn! We recently updated the recipe to double sauce for greater servings. This recipe was absolutely delicious. I can’t wait to try it with out veggies especially now that fall veggies are in season. I added extra red curry paste and lime because I like spicy and tangy. Ate it over brown rice and added some chopped, toasted cashews. We had this for dinner tonight at our house, and WOW! It was a simple enough weeknight dinner and the flavors were so rich. We we definitely be making this again! Great job! I was wondering…do the vegetables gets mixed into the curry or are they eaten on the side. This probably sounds silly, but I wasn’t sure since the recipe didn’t specify. Hi! We like them in the curry, but either would work. This curry is delicious! Love the roasted veggies and the sauce is incredible! Will definitely be holding on to this recipe! I made this exactly as written and it was AMAZING! I don’t know that I’ve ever roasted red cabbage before but I loved the way it tasted and the curry sauce was so flavorful and rich. I will definitely make this again! Yay! We are so glad you enjoyed it, Lauren! This was a hit with the family! I substituted some kale from the garden for a portion of the cabbage, just because I had it…worked great. To make it more kid-friendly, I used only 3 Tbsp curry paste and then used 2 Tbsp maple syrup. I topped it also with toasted cashews. My son went back for seconds. Thanks Dana!!! My favorite curry dish I’ve ever ever made! I think blending the sauce made it super creamy, which I loved. I didn’t have to tweak the ingredients at all to get the taste I wanted. Seriously so pumped about this recipe. This is one of my go-to recipes now. It’s delicious, nutritious, filling, and quite easy to put together. I’ve subbed out the vegetables for anything you can think of (carrots, pumpkin, butternut, cauliflower) and it’s always been great (though sweet potato has a special spot in my heart). Thanks for the incredible recipe! The description “RICH” in the title, is PERFECT. It had the most rich flavors I have ever tasted! Biggest switch I made was to use unsweetened soy milk and coconut extract to substitute for coconut milk (had recently read about this online as a coconut milk alternative)… it’s not as thick, but flavor is remarkably similar. I just cooked the sauce until it naturally thickened over time. Thanks Dana for such a lovely meal! Dana – I have made many receives from your website and they are all wonderful! I am yet to find a receive that I don’t like. This curry sauce is delicious and I would have never thought to roast purple cabbage but it was delicious. Thank You! I make this curry a couple times a month, just change up the veggies. Great flavour! Just made this recipe as a meal prep for my lunches for the week and it was so easy and delicious! I used extra veggies and roasted for a bit longer, and served it over brown rice and I LOVED IT! Will definitely make again! Best curry I’ve ever made! So easy and so flavourful. Thanks for blessing my life with this recipe!! Yay! We’re glad to hear it, Ellie! I have made many things from Minimalist Baker and therefore it makes me very sad to write this. I made this recipe exactly as written last week, filled my bowl with veggies, rice, and sauce and couldn’t finish the plate. I actually ended up throwing out the sauce. I’m very sorry Minimalist Baker!!!!! But that won’t keep me from coming back and trying other things! I made this tonight and it turned out so good! I made many modifications including lemon not lime juice, onion instead of shallot, and added tofu and mushrooms. Its very filling I found so I may use low fat coconut milk next time. Thanks for sharing your modifications, Patricia! This is a delicious recipe! The flavors are amazing and is definitely something I’ll make again. I will have to make more to have left overs next time! Yay! We’re glad that you and your husband enjoyed it! I must have done somthing wrong here or have the wrong red curry past because it’s so hot and my boyfriend is Indian an not even he can eat it. Is it really 4tbsp red curry paste? I bought my curry past in the store and it was the regular kind so that’s why am confused. Tried to double the amount of counut milk but that did not work ? Hi Julia! I am sorry to hear it was too hot to eat! We make our own DIY Curry Paste and depending on the brand you purchased, 4 tbsp may have been too much. This recipe is amazing. I tweaked it by adding eggplant, mushrooms, green beans, garbanzo beans, cauliflower, brocolli, zucchini, butternut squash, a medley of diced potatoes and diced tomatoes in a large pot simmered down – and it was amazingly good and full of fiber. We’re glad you and your boyfriend enjoyed it, Emily! Fantastic flavors! This is the best vegan curry recipe I’ve found. We’re glad you enjoyed, Richard! This was an absolutely phenomenal dish! The instructions were clear and it was super easy to make. I honestly loved this and plan to make it many more times. Thanks for the great recipe! I tried this last night and it was so good!! Thank you so much for the recipe! I had a question about the sweet potato though, every time I roast sweet potato I feel like maybe I’m overdoing it. It gets super soft and I’m just not sure if that’s the correct texture I’m trying to aim for. I did exactly what your recipe called for. I’m just wondering if it’s supposed to be firmer? The flavor of this curry is excellent, much better than other recipes I’ve tried. I think the proportions and ingredients were just right. I didn’t have red cabbage or broccoli in the house so I used a bell pepper and green beans in addition to the sweet potato. Would definitely want to try red cabbage next time. I made this dinner tonight and it was soooooo good! I did not have any rice or couscous on hand so I served it on top of fried polenta! I will definitely make it that way again! I also only had green curry paste so I added a tablespoon of tomato paste. This is the third of your recipes that I have tried and they are wonderful! I find myself coming back to your website over and over for ideas since my husband and I recently switched to a plant based diet. I found your blog by accident and so glad I did. I made this for my family yesterday and it was amazing. I used the recipe as a base and tweaked it to my liking. I’ll be making this again along with the other delicious recipes on your blog. This dish is just layer upon layer of amazing flavor! I made it exactly per the recipe, but the curry sauce is so versatile I have a feeling you could use it on just about anything. My new favorite MB recipe! I made this last week, and it was so delicious. It was the most flavorful curry I’ve made at home and the veggies mixture was divine, I ate the vegs by themselves the next day. Question: when I made the curry I only had enough for two servings, and it was more of a sauce rather soupy. Your pictures appear to have more liquid. Just wondering if you doubled the recipe for serving or if some veggie stock/water may be missing? I made this tonight and wow… delicious. It took me a while to prepare and make, but next time will be faster I’m sure. Sweet, spicy, salty, earthy—the more I ate, the more I liked it. Thank you! Absolutely delicious! My new favorite comfort food. I’ve made this 3 times in the last two weeks. I omitted the curry powder because I hate the flavor and the lime juice because I didn’t have any. I’ve varied the amount of curry paste: 3 tbsp, then 1 tsp, then 1 tbsp; 1 tsp is too little, but 1 tbsp is too much for most of my friends. I’ll try 2 tsp next time. I used 2 cups each of butternut squash, sweet potato, cauliflower, and red cabbage the first time. The second time I used green beans instead of the sweet potato, but they watered down the sauce too much. I have tried two different brands of coconut milk, one much richer and thicker than the other, but both sauces were delicious. The first time only I separated the cabbage and cauliflower from the sweet potato and butternut squash for roasting. Now I just roast everything together. Since my veggies aren’t completely cooked in the oven, I put everything in the crockpot for about an hour or simmer in a pot on the stove until my veggies are almost tender. I made this to the letter & it was amazing.!!!! I love the combo of all the ingredients. WELL, I adore this recipe. I used to have a favorite red curry (with cauliflower) recipe from America’s Test Kitchen that I’ve made a ton, and I have to say that this is far and away the BEST homemade red curry recipe I’ve ever ever had. Better than ATK! It was quick, and I really like how the curry is poured over the veggies, rather than stewed. I love the roasted vegetables, and how rich and fresh tasting the curry is. I actually used roasted sweet and plain potatoes (diced small), then added cauliflower after 10-15 minutes, because that’s what I had on hand (and thought I’d be using my ATK recipe). I shared with my husband, but quickly scrambled to make more curry the next day to replenish my curry levels. The second time, I added a bit more lime and red curry paste. I’m printing this recipe out and laminating it so I can make it for eternity. This is my new fav Thai Red Curry recipe. I’ve tried several but roasting the veg before and adding it at the end it key. Absolutely delicious. Thanks! Looks delicious…not a big cabbage fan though…how might I substitute another green? I was thinking of pre-cooking some chard ans adding at the end?? Yes, chard would be a good substitute! This recipe is delicious! I was wondering, what would you recommend to add protein to it? For added protein, we recommend chickpeas, tofu or tempeh! Planning on making this for a dinner party! Any recommendations for an additional dish that would pair well? Thanks! Dana, this was AMAZING! And it was super simple to make. I didn’t make the veggies you recommend in the recipe. I did my own combo of roasted veggies and served it with the curry sauce. The substitutions I made were: ghee instead of coconut oil for sauteing the onion and garlic, grounds ginger because I didn’t feel like mincing fresh, and soy sauce because I’m not gf. It made my apartment smell amazing and it tastes amazing also. I will definitely be making this again for my husband. He will LOVE it! Loved loved loved this recipe. VERY filling and will definitely be a staple for me. This was so good! We changed up the the vegetable mixture some, but that sauce is the real winner. We roasted broccoli, sweet potatoes, and green beans, sauteed some kale, and added some garbanzos and tofu to up the protein. Made for great leftovers too! Hi Dana! I made this recipe few days after your post and it was AMAZING! The curry sauce wasn’t that thick, but it was delicious anyways. I also added organic baby carrots to my vegetables. Thanks a lot! I made this last night. The only change I made was to add a can of chick-peas to bump up the protein. My family loved it, even my meat-and-potatoes teenage son! MY curry didn’t turn out as vibrant as this . Also came out a little thin. Any suggestions? Hi Morgan! If you find that it is too thin next time, I recommend letting the liquid simmer longer without stirring. Simmering curry without additional thickening ingredients allows excess liquid to evaporate. Hope this helps! I made this recipe this weekend for my meal prep for the week, amazing! I made this tonight (only diff was soy sauce instead of aminos) and it was flipping AMAZING!!! I never need to go to a Thai restaurant again….now I need to try your vegan Thai iced tea :D THANK YOU!!! This was amazing! Who knew roasted purple cabbage was so good? Isn’t it the best?! We’re on team purple cabbage too! I loved this, have made it twice already. Think I might have found the perfect way to eat more broccoli, baked is the answer. Wow. I am eating this right now. And I am in love! I made cauliflower rice to go with it. And I am very very happy. Followed the recipe exactly and doubled the so I could eat it throughout the week for lunch! As one other reviewer said, it is a little on the salty side for my palate, but my partner didn’t think so. Next time I might cut back on the aminos. WE did add tofu for extra protein (cooked separately in our air-fryer) to sauce right before serving which was a great addition. Might i add, the veggies on their own are AMAZING. I might start roasting my veggies like that more regularly as I found the hint of curry great! I just made this , delicious ! Followed recipe exactly , used coconut sugar instead of maple syrup . Thank you ? Loved his! My 2.5 and 5yr old girls loved it too!! Will be making again! I made this with no changes or substitutions to the recipe- loved the curry base, but the red cabbage totally threw off the flavors for me- I found it made it super bitter. Next time, I’ll definitely leave the cabbage out and maybe play around with the different veggies to roast. This was a winner at our house! My husband loves curry. I used low sodium soy sauce and actually did not have as much as ginger as it called for, but it was still good. I doubled it as we like leftovers. Used one can of full fat coconut milk and one can of light coconut milk. The fresh lime on the top was the finishing touch that made it scrumptious. Thanks for this great recipe! Delicious! I used soy sauce instead of coconut aminos & didn’t have enough red curry paste so I used green to make up the difference. Also doubled it so we could have leftovers. Husband went bananas & said it’s better than the Panang Curry dish from True Food Kitchen. High praise as that’s his fav! Okay, this is a keeper, for sure! Once I got the concept, I decided to just roast what I had on hand–sweet potato, celery, mushrooms, kohlrabi, carrots. I just threw the whole lot in the oven for 30 minutes and nothing burned and it didn’t all turn to mush, either–just right. 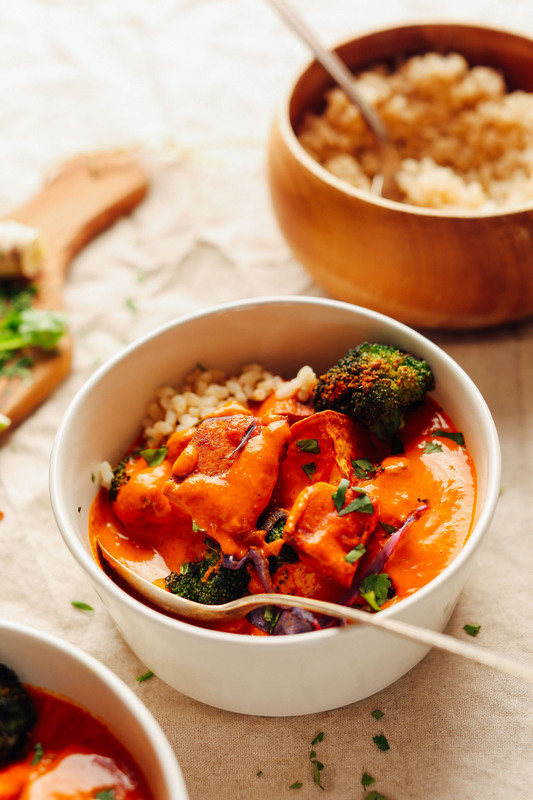 I served it over Lundgren’s Red Thai Curry Brown Rice, but it’s the sauce that pulls it altogether into something sensational. I have a wonder, Dana…what if you developed a similar sauce without the coconut milk (cuz you know I used the full fat version!) and used jarred red peppers and whirled it all up in the Vitamix? I had enough leftovers for part of a second meal. I’m going to stir in white beans and bake it with a bread crumb/non dairy cheese topping–serve with the left over red curry sauce. Can’t think why that wouldn’t be a good thing. Thanks for a super recipe! I gave it four stars so I would have a star left over for something that just blows me out of the water…no, that’s lousy thinking–it works great for a weekday meal, so five stars. Amazing!!! As always. Thank you so much for all your recipes. My husband I are curry takeout hounds and now I have a curry recipe I can make at home that satisfies my curry addiction ?. All of my vegan friends rely on your website. Would love to see a vegan cookbook from you. It would be a staple in my kitchen! This is one of my favorite dishes to make. I just throw it in the blender (with extra spices) & roast different veggies in different ways. It’s great with any grain or rice, too. As always.. perfect. Thanks! I love the depth and richness of this curry! I added carrots to the curry, and opted to blend it. And I red bell pepper to the veggie mix. I will definitely make this again! Made almost as written but with coconut cream and different veggies. It was absolutely amazing. Tastes just like our favorite Thai restaurant. I did blend the sauce and I think that helped with the creaminess. This is a very tasty recipe and quite easy to make, too! I might double the curry the next time I make it, though, because the roughly two cups of curry the recipe makes is a bit scant for 4 servings for my curry loving palate. Super easy to make and so yummy!!!! I doubled the recipe b/c I didn’t think the curry would be enough but you don’t need much of the curry, it’s sure rich. So good! I made this for dinner last night, and it was DELICIOUS – like every other Minimalist Baker recipe I’ve tried!!! I have made several curries, but the depth of flavor in this one was really special! Roasting the vegetables added such great flavor too! I will definitely be making this one again and again! Thank you, Dana!!!! Could this recipe be done without using any sweetener? Normally I’m fine with adding a little bit of sugar, but I’m currebtly trying to stay away from any added sugar. Thanks! The sweetener balances out the flavors, but if you’re looking to avoid sugar, what about stevia? Otherwise, omit. I love this recipe, but I want to know if I can substitute the red paste with green? Yes! It will just take on a different flavor and hue. This is a 10/10! We made it midday and let it cool, then heated it up for dinner. Flavors were incredible – thank you! I’ve tried to make Thai curry so many times and never was it as amazing as this! Thank you! If you’re sensitive to sugar, you could probably put less and it would still be great. It took longer than 30 minutes for me but I’m a slow chopper.. I just made this, but realized far too late that I didn’t have curry paste on hand (and neither the ingredients to make it), so I subbed about 2 tbsp of garam masala and made basically a different curry dish — more like an Indian curry than a Thai curry, but still delicious. I have never considered roasting vegetables before adding them to a curry, and I love how the broccoli remained so bright and gave the curry a rich, almost charred flavor. THIS IS THE CURRY OF MY DREAMS. Is the curry something I could make a large batch of and freeze, then just unthaw and add veggies (I don’t have a lot of time to cook on weekdays )? Interesting recipe, I like it! Look at Chinese vegetarian recipes are also very interesting, I have been preparing them for some time and I’m happy! Dana- another awesome recipe! My family loved it (as always) :) thankyou so much! I was prepping a pan of veggies to roast when this email hit my phone. Yep. Made it!! Awesome ? and doubled the red curry paste recipe so I can play with more stuff this week. Can I freeze the paste if I don’t use it quickly enough? awesome! And yes, you can freeze the paste in ice cube trays and store it in the freezer for months! Will it work to use curry powder instead of paste? curry powder is usually a combination of dried spices such as cumin ,fenugreek, coriander ,cinnamon etc. the proportions can vary according to whether its medium or hot curry powder. Curry paste is more oily and usually contains fresh herbs and spices such as garlic ,ginger. Paste is required in this recipe. I tried the Curry recipe and mine tastes way to salty .. I followed the recipe to a T except I only had enough lime juice for a few teaspoons .. how can I correct this to make it not salty? Was it possibly the coconut aminos?… But I used a tablespoon as directed? Sorry about that! Perhaps scale back on the coconut aminos. Because this is a recipe with a lot of flavor, that’s why I went with the additional coconut aminos for depth. But omit it next time if you need! Can I sub almond milk for coconut? Almond milk and full fat coconut milk are really different. Full fat coconut comes in a can and parts of it have often solidified. You could probably use almond in a pinch, but the curry would be much less sweet and much less creamy. I would be interested to see how that would turn out! The end result won’t be the same. Coconut milk has a greater fat content that makes this curry unique and delicious. Almond milk will let you with a very watery and bland result. That’s my opinion based on experience using both milks. The best sub in my opinion would be rice milk. Is that cauliflower rice in the picture? This looks great! I only have green curry paste – do you think that would work? That would also taste really good, it would just have a different (milder) flavour! Can you clarify if you are supposed to toss the sweet potatoes together with the other vegetables in the oil, maple syrup, curry, salt, and then pick the sweet potatoes out of that mix and bake them separately? That’s what it sounds like but I’m not clear if that’s what you meant. If so, it sounds like a lot of work. Thanks. Yeah that’s what I did! But you could also toss the vegetables separately. I did that to save cleaning one more bowl. That’s what I did too!! Dana can you suggest a substitution for coconut milk if one has a food sensitivity to it and is trying to avoid it. Good to know! My husband is allergic to coconut, so I am always looking for a good coconut milk substitute! Thank you and I can’t wait to try this recipe! Looks scrumptious! Just wondering, why specifically skin-on sweet potato cubes? You can peel them, but I prefer the skin – I feel it helps the potatoes roast better (it helps keep in the moisture). And I think there are good vitamins in the skin.